Police are giving young children Heckler & Koch guns to handle at community events in England. At a recent summer fete in east London, the Met ran a stall displaying a H&K MP5 submachine gun. Children as young as seven were allowed to pose for photos holding the police weapon, which has a firing rate of 800 rounds per minute. On Tuesday May 6th around 70 people staged a demonstration against arms manufacturer Heckler & Koch‘s Nottingham-based sales HQ. The aim of this demonstration was threefold – to expose the company’s location, to publicise the unethical nature of its business, and to launch a campaign to shut it down. Protesters of all ages gathered in the sunshine with a variety of colourful banners and placards, some dressed as casualties of war – a reminder of the 1.5 million people who have been killed by Heckler & Koch’s deadly products. From busy Abbey Bridge, the protesters marched along Lenton Lane to the small industrial park that contains H&K’s unmarked warehouse. Around 40 police were waiting, to prevent entry into the industrial park. Around the corner, mounted police were on standby. 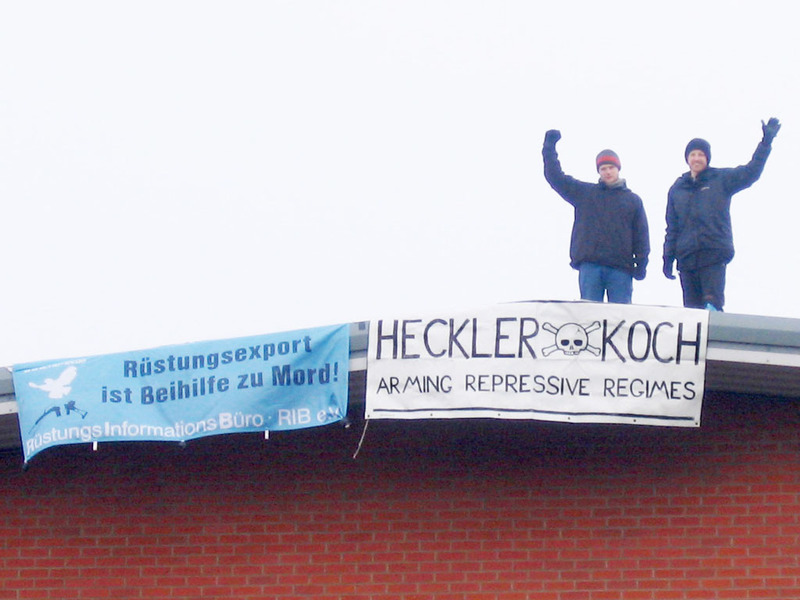 The demonstrators gathered on either side of the gate and listened to speeches about the devastating effect of Heckler & Koch’s weapons in countries around the world. Hundreds of leaflets explaining the purpose of the demonstration were handed out to passers by, some of whom honked their horns in approval. There was a speech about the inspirational Smash EDO campaign, which has been very effective in targeting an arms company in Brighton. A portable sound system played reggae in the sunshine. Efforts to garner media coverage revealed a famliar pattern: Having received a press release about the demonstration, reporters contacted Heckler & Koch for a statement. To make this unwanted media attention go away, H&K then called Notts police, whose press office called the media outlets, telling their editors that it would be irresponsible for them to cover the story as it could lead to criminals trying to break in to steal weapons stored at Heckler & Koch’s premises. It doesn’t take a genius to see that this reason is bogus: The fact is that the location of the company is already in the public domain. It is available to anyone with an internet connection, and not just on various campaign websites, but from Companies House and the British Defence Equipment Catalogue and various other sources. If the building can be discovered by peace campaigners, then it can be discovered by criminal gangs. If the security policy of H&K and Notts police relies on no-one finding out the company’s location, then clearly it is they who are irresponsible, not the campaign or the media. A large warehouse stocked with high-power assault rifles and submachine guns with inadequate security to prevent a robbery is clearly a significant danger to the public, and such a danger is very much in the public interest. Despite this, some media outlets acquiesced to the police request, choosing to accept self-censorship rather than challenge the police. Fortunately ITV Central News was not scared off, and broadcast a report on the 10 o’clock news. Despite the lawful nature of the protest, police surveillance was oppressive. Evidence Gatherers from the local force were supplemented by the officers of a Forward Intelligence Team in systematically photographing and filming protesters throughout the demonstration. Two protesters were threatened with arrest for blocking a FIT cameraman’s view of the demonstration, and another two were followed by police after the demonstration. A contingent of activists from Nottingham traveled to London to take part in the protests against the DSEi arms fair. Tuesday September 11th was DSEi’s opening day, and a Day Of Action against the arms fair. In the morning there was a colourful march called by Campaign Against the Arms Trade that ended in a rally outside the arms fair. The police tried to corral the protesters inside a pen but gave up when the crowd spilled out to hear speakers including comedian and activist Mark Thomas. As usual, policing of the event was heavy-handed with a bill to the taxpayer that ran into millions. In addition to a massive police presence at the arms fair, police vehicles remained outside the RampART social centre to monitor and intimidate activists. Protesters from Nottingham were detained and searched, and one was taken into custody twice. Despite this, the police failed to prevent the Space Hijackers from pulling off a spectacular media stunt: The anarchist group drove a 60-ton tank up to the west entrance of the arms fair and “auctioned” it off to the highest cash bidder, satirising the unethical nature of the arms trade. Check the Space Hijackers website for the hilarious full story. In other actions, a group of activists from Brighton tried to storm the arms fair but were arrested, a pair of London Catholic Worker activists poured fake blood all over a gangway to the arms fair, and a lady of 66 was arrested for trying to leaflet arms dealers. Thanks to the efforts of campaigners like Mark Thomas, customs officers patrolled the arms fair for the first time and two exhibitors were thrown out for marketing leg irons. The number of demonstrators was down on previous years, perhaps due in part to the recent rise of climate change activism, and some were frustrated that they were unable to disrupt the arms fair. However the protests got good coverage in local and national media, prompting DSEi and DESO to field spokesmen to talk down the “tanks, ships and aircraft” and talk up the “humanitarian” and “peacekeeping” applications. For full coverage of actions against the arms fair, check Indymedia. There are also a couple of good BBC video clips here and here. (Can you spot the Nottingham activists in both?) And a great comment piece in The Guardian sums up the links between DSEi and war, corruption and human rights abuses. DSEi will be back in 2009; the dates have been confirmed. DSEi will be back and so will we. Fed up with intrusive surveillance and intimidation, Disarm DSEi activists have established FIT Watch – a movement aimed at turning the tables on police Forward Intelligence Teams.